A majority of the San Diego City Council is open to forming a government-run agency to buy power for city residents – though it is not yet a done deal. It is now politically possible to poke a giant hole in San Diego Gas & Electric’s longtime monopoly. In the past, the company has fought off such attempts to weaken its monopoly. Mayor Kevin Faulconer’s administration is going to be coming up with a business plan for such an agency over the next several months. The mayor hopes to make a decision before the end of 2018, said spokesman Greg Block. Local governments across California are forming these agencies, known as community choice aggregators, or CCAs. San Diego is unique, though, because of how small SDG&E is relative to the state’s two other major power companies. SDG&E would immediately lose about half its customers to a CCA, though the company would still run and profit from the use of its power lines and would still provide natural gas for home heating. The Climate Action Plan, created in 2015, may force the city to distance itself from SDG&E. The plan says the city must get 100 percent of its power from renewable sources – namely wind and solar – by 2035. SDG&E now says it wants to work with the city to achieve that goal, but details of the company’s plan are not yet public. There is also no indication from the city if the company’s plan is a good option or even realistic. 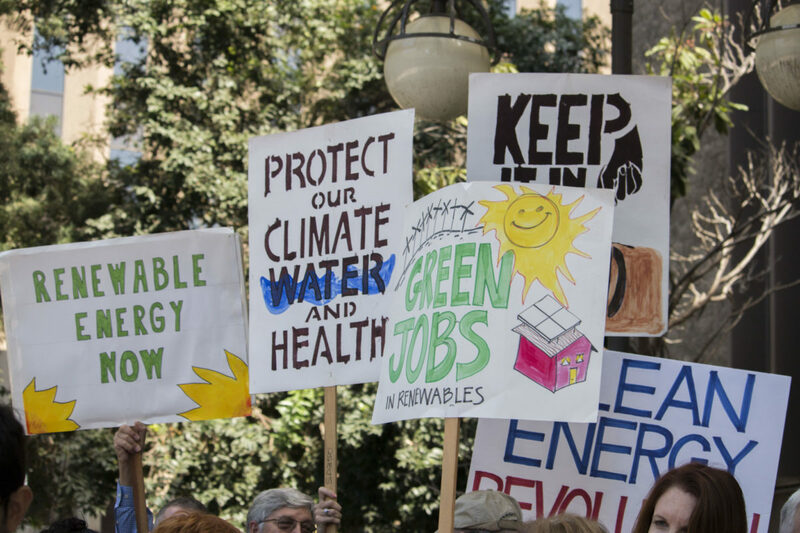 Behind the Democrats is a progressive coalition of environmentalists and labor unions. Environmentalists believe the city will be able to provider greener energy than SDG&E. Two local chapters of the International Brotherhood of Electric Workers, which includes people who work at SDG&E, want jobs that could come from new renewable energy projects. That coalition is powerful but breakable: If the unions see that SDG&E can offer more jobs, it could bail on the government-run power idea. At least two of the four Council Republicans have also said they are interested in a CCA. For instance, Councilman Scott Sherman favors seeing some competition with SDG&E, though he isn’t yet sure that a government-run agency is the right kind of competition. Councilman Mark Kersey is “generally open to the idea” of a CCA, a spokeswoman said, but wants to see more details. Councilman Chris Cate clearly doubts some of the pro-CCA talking points he’s seen, but he said he’s trying to remain neutral, and therefore isn’t outright opposed yet. Right now, there’s a waiting game under way as the California Public Utilities Commission considers what kind of “exit fees” power companies, including SDG&E, can charge customers who join a CCA. Last week, the mayor announced he wanted more time to study what it would take to form a CCA and create a business plan to take into account all those factors. SDG&E’s allies claimed a victory because more studying delays a decision, while CCA supporters said the business plan had to happen anyway, so the mayor was advancing their cause. In the middle is the simple notion that the city needs to spend more time figuring out the risks and rewards of upending the region’s energy market. A public power agency could be a legacy for Faulconer and others if it works out, or a political albatross if it does not. Councilwoman Barbara Bry, a Democrat, said she thinks a CCA is the most efficient and cost-effective way to meet the city’s 100 percent renewable power target, but she doesn’t think the city is ready to decide without more studying and planning. So, while it looks like there are the votes to form a CCA, a lot may depend on what that plan says and what else happens in 2018, such as whether the plan confirms the results of an earlier study that shows, under some scenarios, the city can provide greener and cheaper power whether SDG&E guarantees new jobs for union members and whether a candidate’s position on CCAs becomes a litmus test in any of the four City Council races next year.